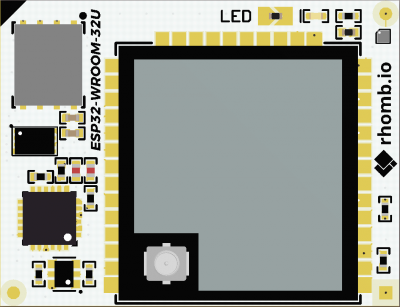 RHOMBIO_ESP32DMWB1K is a kit based on Rhomb.io boards that are ready to build electronic devices that can be connected to Amazon AWS. Class 2 - Phobos Motherboard. Class 2 boards allow the interconnection between Master modules, Slave modules and the real world; Master modules integrate micro-controllers. The kit is designed to build complete devices ready to be connected to cloud computing platforms. 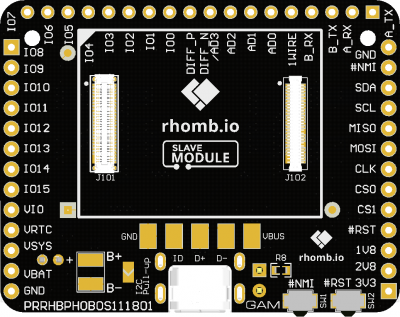 In addition, there is the possibility of adding any type of Rhomb.io Slave module; communications, sensing, storage or any other. Phobos has up to 44 accessible I/O and power pins for easy connection to a wide range of peripherals. The kit is ready to build, program and install. The Motherboard and the Master module are 100% compliant with the Rhomb.io ecosystem. This kit also includes an IPEX antenna for wireless connnectivity. 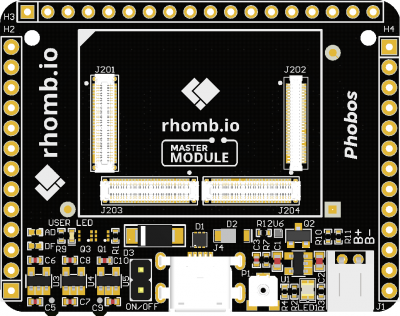 Phobos board is a certified Class 2 Rhomb.io motherboard that allows the creation of electronic devices using exclusively standard Rhomb.io modules. It combines the ease-of-use of Rhomb.io modules with a reduced form factor, and it has been developed for the Internet of Things (IoT) bearing in mind fast product development. The board also includes a battery management circuit bringing the designer the capacity to make portable devices. Find more information in the Class 2 - Phobos datasheet. Find more information in the S100 Master - ESP32 datasheet. Before powering up the RHOMBIO_ESP32DMWB1K, please make sure that the Kit has been received in good condition with no obvious signs of damage. Also make sure the antenna is properly connected in the ESP32 module. Here you can find a getting started process of this excellent Amazon guide. To establish a serial connection between your host machine and the RHOMBIO_ESP32DMWB1K, you need to install CP210x USB to UART Bridge VCP drivers. You can download these drivers from Silicon Labs. 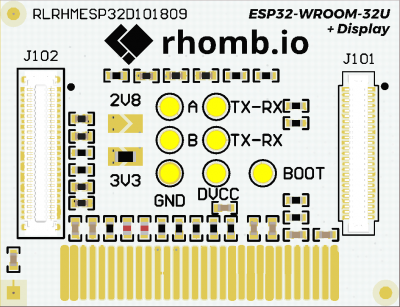 For more information about establishing a serial connection with Rhomb.io kits, see Establish Serial Connection with ESP32. After you establish a serial connection, make a note of the serial port for your board's connection. You need it when you build the demo. Note: When following the toolchain setup instructions, do not proceed to the Get ESP-IDF instructions under Next Steps. Instead, continue following the instructions on this page. After your environment is set up, you can download Amazon FreeRTOS from GitHub. Configurations of Amazon FreeRTOS for the Espressif boards are not available from the Amazon FreeRTOS console. Clone the amazon-freertos repository from GitHub. In this tutorial, the path to the amazon-freertos directory is referred to as BASE_FOLDER. Note: The maximum length of a file path on Microsoft Windows is 260 characters. The longest path in the Amazon FreeRTOS download is 122 characters. To accommodate the files in the Amazon FreeRTOS projects, make sure that the path to the amazon-freertos directory is fewer than 98 characters long. For example, C:\Users\Username\Dev\amazon-freertos works, but C:\Users\Username\Documents\Development\Projects\amazon-freertos causes build failures. If you are running Windows, use the easy_install awscli to install the AWS CLI in the mingw32 environment. If you are running macOS or Linux, make sure the AWS CLI is installed on your system. For more information, see Installing the AWS Command Line Interface. Run aws configure and configure the AWS CLI with your AWS Access Key ID, Secret Access Key, and Default region name. For more information, see Configuring the AWS CLI. The complete path to the amazon-freertos directory on your computer. Make sure that you use forward slashes to specify this path. The name that you want to assign to the AWS IoT thing that represents your board. The SSID of your Wi-Fi network. The password for your Wi-Fi network. If you are running macOS or Linux, open a terminal prompt. If you are running Windows, open mingw32.exe. This script creates an IoT thing, certificate, and policy. It attaches the IoT policy to the certificate and the certificate to the IoT thing. It also populates the aws_clientcredential.h file with your AWS IoT endpoint, Wi-Fi SSID, and credentials. Finally, it formats your certificate and private key and writes them to the aws_clientcredential.h header file. For more information about the script, see the README.md in the <BASE_FOLDER>/tools/aws_config_quick_start directory. Connect your board to your host computer. If you are using macOS or Linux, open a terminal. If you are using Windows, open mingw32.exe (downloaded from mysys toolchain). To confirm a selection in the menu, choose Select. To save a configuration, choose Save. To exit the menu, choose Exit. In the Espressif IoT Development Framework Configuration menu, navigate to Serial flasher config. Choose Default serial port' to configure the serial port. The serial port you configure here is used to write the demo application to your board. On Windows, serial ports have names like COM1. On macOS, they start with /dev/cu. On Linux, they start with /dev/tty. Choose Default baud rate to change the default baud rate to use while communicating with your board. Increasing the baud rate can reduce the time required to flash your board. Depending on your hardware, you can increase the default baud rate up to 921600. After you set up your board's configuration, save and exit the menu. To monitor the demo, you can subscribe to the MQTT topic where the demo application publishes messages, freertos/demos/echo. 36 7385 [MQTTEcho] MQTT echo demo finished. Amazon FreeRTOS supports Bluetooth Low Energy (BLE) connectivity. You can download Amazon FreeRTOS with BLE from GitHub. The Amazon FreeRTOS BLE library is still in public beta, so you need to switch branches to access the code for your board. Check out the branch named feature/ble-beta. To run the Amazon FreeRTOS demo project across BLE, you need to run the Amazon FreeRTOS BLE Mobile SDK Demo Application on an iOS or Android mobile device. Follow the instructions in Mobile SDKs for Amazon FreeRTOS Bluetooth Devices to download and install the SDK for your mobile platform on your host computer. Follow the instructions in Amazon FreeRTOS BLE Mobile SDK Demo Application to set up the demo mobile application on your mobile device. For instructions about how to run the MQTT over BLE demo on your board, see the MQTT over BLE demo application. For instructions about how to run the Wi-Fi Provisioning demo on your board, see the Wi-Fi Provisioning demo application. If you are using a Mac and it does not recognize your RHOMBIO_ESP32DMWB1K, make sure you do not have the D2XX drivers installed. To uninstall them, follow the instructions in the FTDI Drivers Installation Guide for Mac OS X. The monitor utility provided by ESP-IDF (and invoked using make monitor) helps you decode addresses. For this reason, it can help you get some meaningful backtraces in the event the application crashes. For more information, see Automatically Decoding Addresses on the Espressif website. It is also possible to enable GDBstub for communication with gdb without requiring any special JTAG hardware. For more information, see Launch GDB for GDBStub. For information about setting up an OpenOCD-based environment if JTAG hardware-based debugging is required, see JTAG Debugging. If pyserial cannot be installed using pip on macOS, download it from pyserial. If you see errors when you run idf_monitor.py, use Python 2.7. Required libraries from ESP-IDF are included in Amazon FreeRTOS, so there is no need to download them externally. If the IDF_PATH environment variable is set, we recommend that you clear it before you build Amazon FreeRTOS. You need a JTAG to USB cable. We use a USB to MPSSE cable (for example, the FTDI C232HM-DDHSL-0). Connect the USB side of the FTDI C232HM-DDHSL-0 to your computer and the other side as described in Debugging Code on Espressif ESP32-DevKitC and ESP-WROVER-KIT. The FTDI C232HM-DDHSL-0 device should appear in Device Manager under Universal Serial Bus Controllers. From the list of USB controllers, right-click the FTDI C232HM-DDHSL-0 device (the manufacturer is FTDI), and choose Properties. In the properties window, choose the Details tab to see the properties of the device. If the device is not listed, install the Windows driver for FTDI C232HM-DDHSL-0. Unzip the file to C:\ and add C:\openocd-esp32\bin to your system path. Run zadig.exe. From the Options menu, choose List All Devices. From the drop-down menu, choose C232HM-DDHSL-0'. In the target driver box, to the right of the green arrow, choose WinUSB. From the drop-down box under the target driver box, choose the arrow, and then choose Install Driver. Choose Replace Driver. Leave this command prompt open. Open a new command prompt, navigate to your msys32 directory, and run mingw32.exe. In the mingw32 terminal, navigate to <BASE_FOLDER>\demos\espressif\esp32_devkitc_esp_wrover_kit\make and run make flash monitor. Open another mingw32 terminal, navigate to <BASE_FOLDER>\demos\espressif\esp32_devkitc_esp_wrover_kit\make and run xtensa-esp32-elf-gdb -x gdbinit build/aws_demos.elf. The program should stop in the main function. Note: The ESP32 supports a maximum of two break points. Download the FTDI driver for macOS. Extract the downloaded .tar file and set the path in .bash_profile to <OCD_INSTALL_DIR>/openocd-esp32/bin. Open demos/espressif/esp32_devkitc_esp_wrover_kit/esp32_devkitj_v1.cfg. The vendor ID and product ID for your device are specified in a line that begins with ftdi_vid_pid. Change the IDs to match the IDs from the system_profiler output in the previous step. The program should stop at main(). Download OpenOCD. Extract the tarball and follow the installation instructions in the readme file. The /dev/ttyUSBn interface with the lower number is used for JTAG communication. The other interface is routed to the ESP32’s serial port (UART) and is used for uploading code to the ESP32’s flash memory. The program should stop in main(). This page was last modified on 22 February 2019, at 12:54.